where if equals the frequency of G2 at equilibrium. This final equation tells us that the allelic frequency at equilibrium is determined solely by the forward and reverse mutation rates. Summary of effects When the only evolutionary force acting on a population is mutation, allelic frequencies change with the passage of time because some alleles mutate into others. Eventually, these allelic frequencies reach equilibrium and are determined only by the forward and reverse mutation rates. When the allelic frequencies reach equilibrium, the Hardy-Weinberg law tells us that genotypic frequencies also will remain the same. 23.9 Change due to recurrent mutation slows as the frequency of p drops. Allelic frequencies are approaching mutational equilibrium at typical low mutation rates. The allelic frequency of C1 decreases as a result of forward (C1 :C2) mutation at rate ^ (.0001) and increases as a result of reverse (C2 : C1) mutation at rate v (.00001). 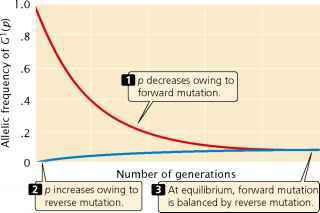 Owing to the low rate of mutations, eventual equilibrium takes many generations to be reached.